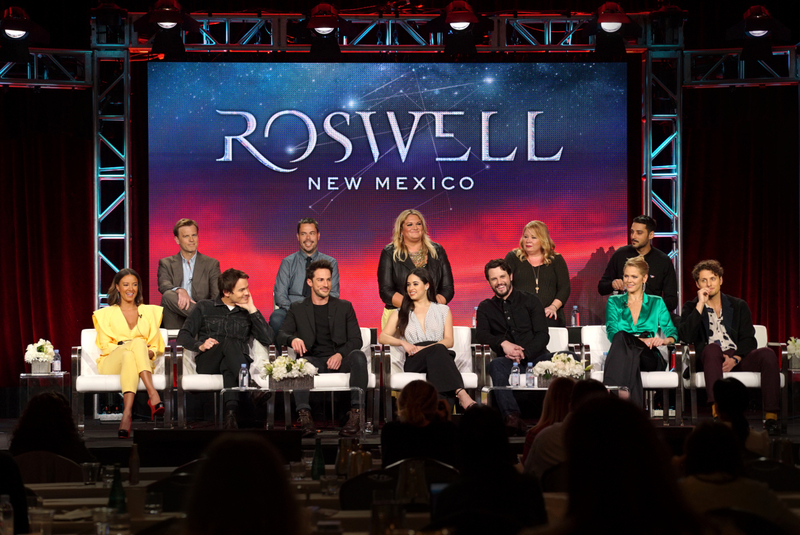 TCA Winter Press Tour 2019: Roswell, New Mexico — Image CWTCAW19_KE_0001r.jpg — Pictured (L-R top row): Trevor St. John, Executive Producer Christopher Hollier, Executive Producer Carina Adly MacKenzie, Executive Producer Julie Plec, Karan Oberoi (L-R bottom row): Heather Hemmens, Tyler Blackburn, Michael Trevino, Jeanine Mason, Nathan Dean Parsons, Lily Cowles and Michael Vlamis (ROSWELL, NEW MEXICO) at The CW’s 2019 Winter TCA Session at The Langham Hotel in Pasadena, CA on Thursday, January 31, 2019. Photo: Kevin Estrada/The CW ÃÂÃÂ© 2019 The CW Network, LLC. All Rights Reserved.